yummm! great going Claudia. these look tasty! Fab recipe! I love panko anything! Very creative! I really love site hopping, along the way, I've seen that Gourmandia is a good source of recipes and even video recipes, too! Really a site worth visiting! 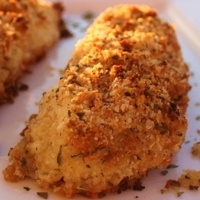 Looks really good and could easily be made gluten free breadcrumbs. I love that they are baked. Can anyone let me know what kind or the name of the grating cheese I should use? Pecorino Romano would be a good choice. Thanks for this recipe. Looks wonderful. I always preferred baked vs fried. Great idea, baking them, definitely healthy. I've never thought of adding cheese to the bread crumbs. Thats creative!